mediainfo-gui is a Graphical interface for MediaInfo and ExifTool. It depends on MediaInfo and ExifTool (latest production releases are available in my repo). 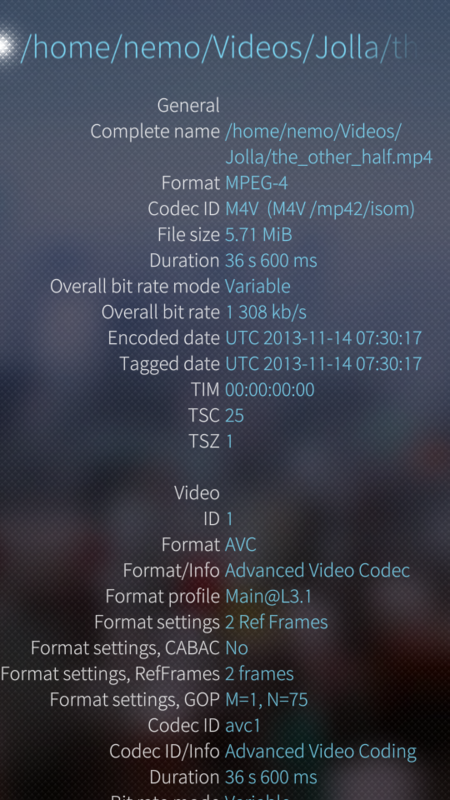 The file browser is taken from llelectronics's LLs Video Player (big thanks to him). I am on 2.2.0.29 Mouhijoki. Apart from the advice to run an up-to-date OS, I see no reason why it should not work (it did then I was on 2.1.4.14 and I can't think of any related changes, or it must be SDK version related). For now maybe stick to 0.2-9 and try again once on a more recent SailifshOS version? Indeed. I just reflashed my Xperia (mainly to improve the terrible partition scheme in previous releases of SailfishX), now the browse command in mediainfo-gui is OK. So, Lapuanjoki was probably guilty. Works fine on all my devices (nothing changed in the filebrowser). Any errors from the commandline? In release 0.2-0 ExifTool is no longer optional. The reason is I introduced some functions for photo metadata, and MediaInfo is simple not suited for that (it has a focus on video and audio). After last update don't open a files. Instead of showing the info of media file it's opening "directory of file/name of file" and empty page. You are right, something goes wrong when no configuration is present. Should be fixed in 0.0.1-16. Only number 2/ was playable, video and audio. Is resolution which causes problems ? ... but I guess those detail questions should be asked somewhere else like MSameer. ... but still what about the compatibility check, is it doable ? Although I can understand the question, it would be too hard for me. A lot depends on installed audio/video codecs and the player used. I don't even know if there is a list of that is supported or not. Since update 0.1.4, the portrait/landscape behaviour in GUI has become really annoying. Explain "annoying" please. There should me no change in behaviour since the latest update. All I can say is that the fillebrower part is autorotate, and the app itself is portrait. Is that what you are referring to? Perhaps it's only in my configuration (Uitukka), but autorotate isn't functional in the filebrowser part (always landscape here). EDIT - Sorry, issue fixed after reboot. No idea of what happened. Apologies. The problem is solved with this new version. Again thank you for your work. Good to hear and thanks for reporting! @manisblack - okay, have you tried rebooting? Great app!, works a treat and is very useful, thanks very much! [W] QQmlImportDatabase::registerPluginTypes:1875 - Module 'Sailfish.Silica' does not contain a module identifier directive - it cannot be protected from external registrations. I realized that the "Qt.labs.folderlistmodel" module is not installed but how to fix the problem. you probably have not yet installed Mediainfo app. 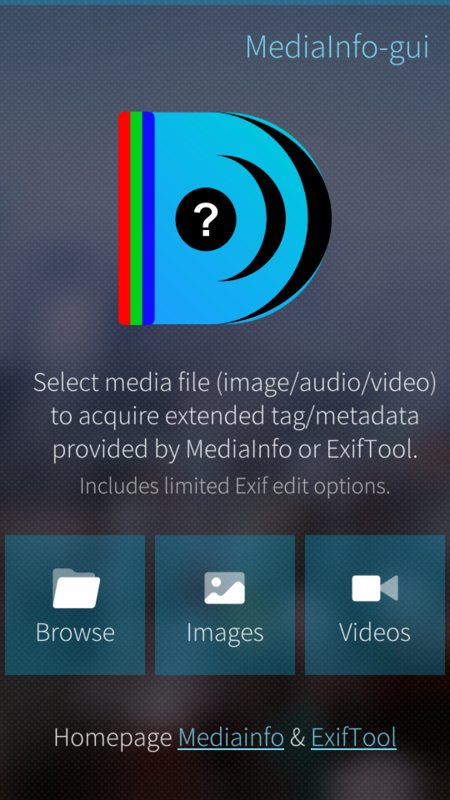 Install Mediainfo app first, then install Mediainfo-gui app. I see the issues is not related to the sailfish version, but to a missing package called qt5-qtdeclarative-import-folderlistmodel. No need to install MediaInfo first, mediainfo-gui will install MediaInfo. I had to manually install mediainfo as mediainfo-gui did not install it for me. That's odd, it is declared as a dependency. Maybe it works for me because I already have my repo active. I will have a closer look at it later.